Is India adopting an odd pro-Islamic and anti-Hindu foreign Policy? Anti Tamil and Pro Palestine stands of India signal an anti-Hindu and pro-Islamic foreign Policy of Modi Govt. in a cross road. Upananda Brahmachari | Hindu Existence News Bureau | New Delhi | 24 July 2014:: I am so disgusted to hear that India along with BRICS countries today in Geneva UN HQ voted in support of a UN Human Rights Council resolution to launch a probe into Israel’s offensive on Gaza. India joined Brazil, Russia, China and South Africa to vote for a Palestinian-drafted resolution on “Ensuring Respect for international law in The Occupied Palestinian Territories, including East Jersusalem”. The 47-member council adopted the investigation under a draft resolution after a request by Palestine, which has UN observer status. 29 states voted in favour of the investigation. 17 abstained, including many EU states. 1 voted against – the US. The voting came as bloodbath in the Gaza Strip continued unabated today with Israel and Hamas refusing to back down in the 16-day conflict that has killed over 680 Palestinians and 31 Israelis. Yes, US was the only nation to vote against the resolution. European countries abstained. But, India had not the courage to stand by US or to support Israel which is fighting against the largest menace of the present day society, ‘Al Jihad’. Now, it has been proved that Narendra Modi is not courageous enough to put him in the row of Obama nor he cleared his stand to support Palestine the mentor of Hamas which is nothing but a strong exponent of bloody Jihad for the establishment of a Pan Islamic World. Ultimately India had to support a Pan Islamic stand for Palestine with some reasoning of human rights, violation of war principals and obviously the pity death of 680 Palestinians in the period of Ramadan. The death of maximum 15,000-20,000 Palestinians (to my highest estimation) is a big sock for Indian politics and Modi concern but cruel genocide of ‘147,000 Hindu Tamils’ (as many of Tamil and International Rights Orgs claim) in Sri Lanka is not a concern at all for India and for the so called Hindutvawadi BJP led Govt in India. On July 23rd, the official opposition in Canada, the New Democratic Party (NDP) observed the Black Day to commemorate the victims of the Tamil Hindu Genocide in Black July. 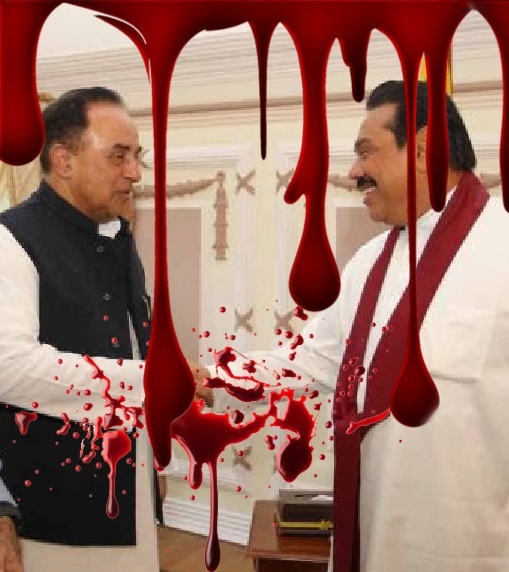 The Tamil organisations observed it worldwide to denounce the dangerous motive of blood thirsty Sinhala Govt. NDP and other Tamil Orgs in Canada remembered the hundreds of Tamils who were killed and the thousands who were displaced when their homes and businesses were destroyed in Sri Lanka from the violence that ensued from the pogroms targeting Tamils that began on July 23, 1983. The perpetrators and organizers of the violence have never been held accountable for their actions. But, a double standard Dr. Subramanian Swamy, a veteran BJP leader and now the chairman of the BJP Committee for Strategic Action, went to Sri Lanka to hold the bloody hand of SL President Mahinda Rajapaksa only to demoralize Tamil Rights Groups trying to expose the reality of a Tamil Genocide in Sri Lanka, 90% of which are the innocent Tamil Hindu poor people of Tamil dominated areas in the north and East of SL. As India is not a signatory to the 1951 Refugee Convention. Refugees have no right to freedom of movement. India’s Foreigners Act 1946 and Citizenship Act 1955 define all non-citizens who enter without visas to be illegal migrants, with no exception for refugees or asylum seekers. Possession of a UNHCR (United Nations High Commissioner for Refugees) refugee certificate does not protect refugees from detention. More than 100,000 Sri Lankan Tamils live in between 115 and 130 refugee camps in Tamil Nadu State in India. Aid workers say that some refugees live in thatched huts, others in small cement blockhouses. There are no proper toilet facilities, bathing facilities or adequate drinking water. There is no rubbish collection, and only some camps have medical facilities. Electricity is provided in some locations, but usually only between 6 am and 6 pm. In some camps there is no electricity for many inmates. Six houses at Thiruvadhavur collapsed in monsoonal rains recently, killing a girl. These Tamils previously sought refuge in India from Sri Lanka’s 1983-2009 extremely brutal civil war. In 2011 a UN expert panel identified war crimes such as abductions, torture and disappearances, in which high government officials were implicated. Over 100,000 people were killed and one million displaced. Tamils were exposed daily to air strikes and atrocities, forcing many to flee to India. And the Tamil Hindus still stay in Sri Lanka unfortunately face the brutal evil of Buddha Sasana. While whole of the world is condemning the Rajapaksa and his predecessors, BJP and Dr. Subramanian Swamy patting his back for the Tamil Genocide in Sri Lanka. 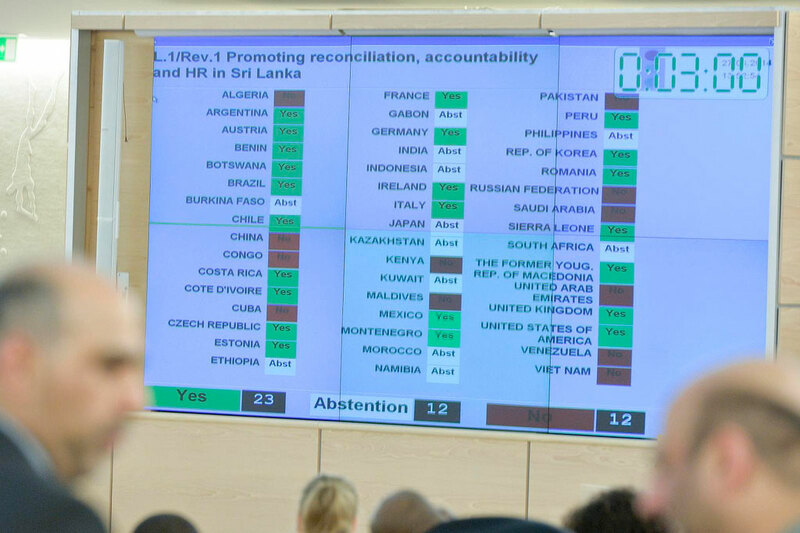 While UN rights council approved inquiry against the anti Tamil Sinhala authorities (by yes: 23, No: 12, Abstention: 12) into alleged abuses in Sri Lanka war in the session on 27th March 2014, why India abstained then? One may say that it was not a Modi Govt then. But, when we see a hobnobbing Swamy with his SL Paksa, it would be another story of India’s voting against motion to support Sri Lanka. On that resolution UNHRC (United Nations Human Rights Council) said: ”The Sri Lankan Government declared victory over the rebel LTTE in May 2009, after a conflict that had raged on and off for nearly three decades and killed thousands of people. The final months of the conflict had generated concerns about alleged violations of international human rights and humanitarian law”. The matter was unheard then by Indian authority and is still now in force as resumed by the Dr Subramanian Swamy and his gangs in BJP. Speaking on ‘India under Modi: relevance for the region and the world’, captioned forum organised by Bandaranaike Centre for International Studies in Colombo on Monday ( July 21st) he said India’s foreign policy shall henceforth be guided by national interest and not regional interest. Referring to the meeting Dr. Swamy and his team had with President Mahinda Rajapaksa earlier on Monday, he said, “We said let us delink Indo-Lanka relations from Tamil Nadu and problems of the Tamils.” However, Mr. Swamy was quick to add that as a friend he would urge Sri Lanka to address certain issues of the 13th Amendment, which he said, remain “unnecessarily” unresolved. “If our friendship and interaction develops sufficiently, we will give you ideas on what could be done.” This certification for Rajapaksa by Swamy must affect the politics in India and specially in Tamil Nadu, to make a debacle for BJP in the next. The International Community, Civilized Democratic Countries like Canada, US and EU are working hard to find justice to the oppressed, helpless Hindu Tamils who are under an army occupation in Sri Lanka, where Hindu Tamil girls & women are being raped very often; Torture, killings, arrests are made under draconian PTA law; Military presence at the ratio of one soldier to every seven civilians (1 : 7); More than 75% of the military stationed in the North & East – the traditional & historical homeland of the Hindu Tamils; Military is forcefully taking away the legal lands of the Tamils where they lived for centuries; Hindu temples are turned into Buddha Stupas here and there; shame on Swamy that you are just eye washing us in a big Hindu name. Shame, shame, shame! India under Modi’s leadership for Good days (acche din anewala hai) may go opposite to Canada, Israel or US for a freak relation with Sri Lanka, Palestine or Pakistan, but loosing the reality out of grip may put the Nation more shocks from the neighboring countries with a bad dividend from the investments of wrong efforts. Modi must not take such a inconceivable steps to ruin the interest of victimized Tamil Hindu people in Sri Lanka and India too. But the managers of Modi in external affairs showed their utter incapacity as they failed to take strong and necessary steps in violation of cease fire, cross border terrorism coming from Pakistan and China with border disputes and intrusions; atrocities on Hindu minorities in Bangladesh and Pakistan; proper addressing the Tamil Hindu plight in neighboring Sri Lanka and finally supported Palestinian Jihad in the name of rights violation. So the question is most pertinent: Is India adopting a pro Islamic and anti Hindu foreign Policy? Courtesy: K Rasingam | The Hindu | UNHRC | UNHCR. Related: “Hamas Is Islamist Extremism Like al Qaeda, ISIS..” said Netanyahu:: NBC News. Israel Batters Hamas —- Kerry to the Rescue:: Frontpage Magazine. If India is NOT supporting Israel, they’re making a TERRIBLE mistake. The Jews are on the front lines of the fight against the jihad. There is NO “conflict over land” or “peace process.” It is the the Arab-Muslim war against the Jews that is the same as the Arab-Muslim war against the Christians, Hindus, Buddhists, Zoroastrians, etc. NO DIFFERENT! The Hamas, Fatah and Muslim Brotherhood charters state their goal as the ANNIHILATION of the Jewish state. They were handed Gaza in 2005 when the Israeli government expelled 11,000 Jews who had established a beautiful 30 year community. (I saw it)! There was NO “land for peace.” As soon as they inhabited Gaza, they destroyed the beautiful farms, houses, buildings, etc., and started lobbing MORE missiles at Israeli civilians – more than 11,000 since 2005. Would YOU tolerate ONE missile in your country???? Israel is being subjected up to 100 per day! This is part of the jihad BUT the world believes the LIE that this is about “a piece of land.” This view is ignorant or based on Jew hatred. The Muslims hate the Jews the most because Jews refused to accept Mohammed’s immoral ideology. You will see that IF you don’t support Israel on the front lines, YOU will be next and YOU will perish or live under Islam! Dear Jew sister, I fully agree with you. Hindus, Buddhists, Jews and Zoroastrians should unite against the murduress cult of Islam. I am sure Modi wanted to support Israel but the problem is, Indian hindus are divided. This gives muslims quiet a lot of power. Supporting Israel would mean, a loss of votes. Most hindus support Israel and jews as is evidant in history- India is the only country with zero violence towards jews. They have been living in India for 2000 years without a single case of proscecution. I and some of my friends(girls included) wanna join Israel army and Mosad in our war against muzzi pests. Hope India-Israel relations grow even better. V. Singh Jaipur. P.S. I really wanna talk to you. Can I hav your email? धन्यवाद मोदी सरकार.. तुमने कर दिया हमारी राष्ट्रवादिता का बंटाढार…. खुद को राष्ट्रवादी कह-कह कर सत्ता में आये मोदी की सरकार ने क्या सोच कर इजराइल के खिलाफ वोट दिया…?? अभी 5 दिन पहले हुए अमरनाथ यात्रा की समस्या का हल तो निकाला नहीं जब वहा लोगो की आस्था के खिलाफ जिहाद किया जा रहा था । लोगो को मारा जा रहा था । खाने के बर्तनों में थूका जा रहा था पेशाब किया जा रहा था । तब इस सरकार को मानवाधिकार की चिंता नहीं हुई ?? 2 दिन पहले ही पाकिस्तान ने हिन्दुस्तानी सेना के एक जवान को मारा । क्या उस जवान का कोई मानवाधिकार नहीं था…??? आखिर हम फिलिस्तीन का समर्थन क्यों करे ?? हर एक अन्तर्राष्ट्रीयमंच पर फिलिस्तीन द्वारा कश्मीर को पाकिस्तान का हिस्सा बताया गया है…. मित्रो जब आतंकवादी यासिर अराफात ने फिलिस्तीन राष्ट्र की घोषणा की तो फिलिस्तीन को… सबसे पहले मान्यता देने वाला देश कौन था ? इंदिरा गाँधी ने मुस्लिम तुस्टीकरण के लिए सबसे पहले फिलिस्तीन को मान्यता दी और यासिर अराफात जैसे आतंकवादी को नेहरु शांति पुरस्कार [5 करोड़ रूपये ] दिया, और राजीव गाँधी ने उसको इंदिरा गाँधी अंतर्राष्ट्रीय शांति पुरस्कार दिया.. राजीव गाँधी ने तो उसको पुरे विश्व में घूमने के लिए बोईंग 747 गिफ्ट में दिया था..
जी हाँ.. इंदिरा गाँधी ने इसे नेहरु शांति पुरस्कार दिया जिसमे एक 2 करोड़ रूपये नगद और 200 ग्राम सोने से बना एक शील्ड होता है.. आप सोचिये 1983 मे मतलब आज से करीब 31 साल पहले 2 करोड रूपये की क्या वैल्यू होगी ? हाय रे कांग्रेस की सत्ता के लिए वोट बैंक की गंदी और घटिया राजनीती ????? I will give modi some more time before I judge him. It may be possible that he wishes to form govt. in J&K before he takes some actions to curb the growing muslim population in India. Lets give him another year before we judge him. This entry was posted on July 24, 2014 by hinduexistence in Attack upon Tamil Hindus in Sri Lanka, Conspiracy against Hindus, Genocide of Hindu Tamil, Hindu Genocide in Sri Lanka, Hindu Struggle, Hindu Tradition and Culture under attack, International Conspiracy against Hindus, Save Tamil Hindus, Torture upon Hindu Tamils in Sri Lanka, Violation of Hindu Religious Rights and tagged anti-Hindu and pro-Islamic foreign Policy of Modi Govt., Canada, Dr. Subramanian Swamy, INDIA, India to be more supportive of Sri Lanka at UN: Dr Subramnian Swamy, India votes in support of UN Human Rights Council resolution on Gaza, inquiry against the anti Tamil Sinhala authorities, Narendra Modi, New Democratic Party (NDP), probe into Israel's offensive on Gaza, reality of a Tamil Genocide in Sri Lanka, Sri Lanka President Mahinda Rajapaksa, Tom Mulcair, UN Refugee Convention 1951, UNHCR (United Nations High Commissioner for Refugees), UNHRC (United Nations Human Rights Council).